A New York Times bestseller that has been made into a major motion picture doesn't need me to share my thoughts about it. So rather than reviewing the book, I will share why it needs to be included in my English language library in Mexico. The writing is crisp with short chapters. Reading can be challenging enough for a second-language learner; by keeping each section short, it gives the reader a sense of accomplishment. The book is steeped with a moral vision that draws out the best in people and thus would be well received in the context of a more traditional Mexican culture. Someone could really make my day by gifting it to my library. This is a wonderful book about how difficult it can be to fit in when you are different. It is told from different character's perspectives, which helped me understand why certain characters did what they did. Wonder is a touching story about a boy, that though to medical circuntances, has a deformed face. Although it always gave him certain difficulties it would only get worse as he starts to go to school. I, personally,loved that you can hear tha story from different points of view and explore more about this wonderful story and learn details along the way. Although I let a few tears as I was reading this book, I personally hated the ending;it just seems like the usual "happy ever after" type of ending. But of course I cant tell you more since you will have to read it yourself. 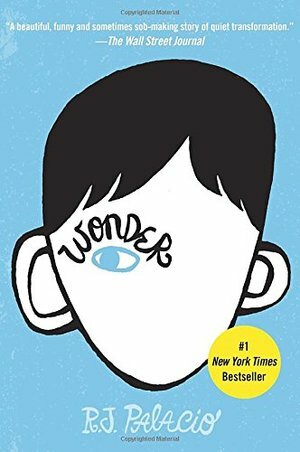 Wonder is the story of August Pullman, Auggie, a ten-year-old boy who has facial abnormalities. Auggie has been home-schooled but is finally going to be entering the fifth grade at a private school called Beecher Prep. Auggie has to deal with being around more people than he is used to and has to go through a terrible time of dealing with bullies, when he just wants to be a normal kid. This story had me in tears a couple of times actually. I also just finished watching the movie trailer and that also had me in tears. But nonetheless, I will be going to see the movie later today and I’m excited! Auggie is such a great character with a huge heart. Even though the kids in this book are so mean to him, he keeps his head high and doesn’t look down to them. Auggie is the type of person who would give you a million and one chances, no matter how many times you turned your back on him. He’s so sweet and adorable and I can’t see why anyone would bully someone like that. Obviously, I know that bullies exist and in some ways, I think everyone can be considered a bully. I may not have been a bully to someone in high school to there face, but I definitely talked about people and there’s no excuses for that. One part in the book that particularly bothered me was when Auggie and Jack were texting each other and Jack tells Auggie “I would want 2 kill myself if I were Julian ;)” Now, I know that they were joking but I still got a nasty pit in my stomach when I read that. That’s such a terrible and awful thing to say about someone. Even if they are a bully, they don’t deserve that kind of treatment. Nobody does! I really enjoyed reading the book from the couple of different perspectives. We obviously get more from Auggie’s side but it was nice to hear about Jack and Olivia’s side of things. Reading from just Auggie’s side, you wouldn’t know the things that his sister, Olivia, feels about him and her family. This was just a great middle-grade book and I highly recommend it to everyone! I hope the movie turns out good. The movie trailer looked like it was pretty on par with the book. Have you read Wonder? Or seen the movie? What did you think? Loved this book. It teaches such an important lessons about acceptance, what being brave really means, and peer pressure. Some stuff about this felt pretty forced. The dog part and the award part didn't feel super well-seeded to me. But I did cry and overall characters had some believable yet unexpected and touching twists. Really enjoyable read with great lesson about empathy. Overall: Katniss would want August to win The Hunger Games. Description: A boy with a facial deformity goes to school with other children for the first time as a fifth grader. This hartwrenching tale of coming of age and acceptance brings him from outcast to leader. I like this book because of the relationships that it delves into, showing commitment, family and the difficultities of fitting in. It makes your heart swell and hurt at the same time. Jessie L.